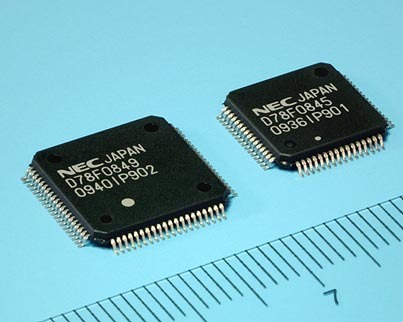 NEC Electronics announced the availability of 14 new all flash microcontrollers, the 78K0/Dx2 product series that includes a wide range of peripherals with either 80 or 64 pins and memory capacity ranging from 60 down to 24 kilobytes. Automotive sales in the emerging markets, including China, India and Brazil, have been showing strong growth buoyed by their continuous economic growth. NEC Electronics is offering these new products to support the manufacturers of small-cars and motorcycles as they capture accelerating consumer demand. The company has been providing MCUs for automotive dashboards for the last ten years by integrating meter functionalities into its 8-bit 78K0 CPUs. To further address the customer demand, NEC Electronics revised the peripherals of the dashboard meters and expects this new line of MCUs will promote its expansion in China and India. The new devices provide a rich set of new peripherals such as stepper motor driver/controller and increased the total number of timer channels from six to nine. Also included are LCD driver/controller, a CAN interface, and a sound generator all in a single chip, enabling system manufacturers to reduce external components and trim system development costs. The extensive lineup of MCUs differs by flash memory capacity, RAM capacity, necessity of CAN interface, number of stepping motor driver/controller channels and LCD drive/display capability. Designers can choose the optimum configuration for their applications. Samples of the new MCUs are currently available. Mass production of these new products is scheduled to begin in October 2010 and is expected to reach a monthly production of 100,000 units by October 2013.